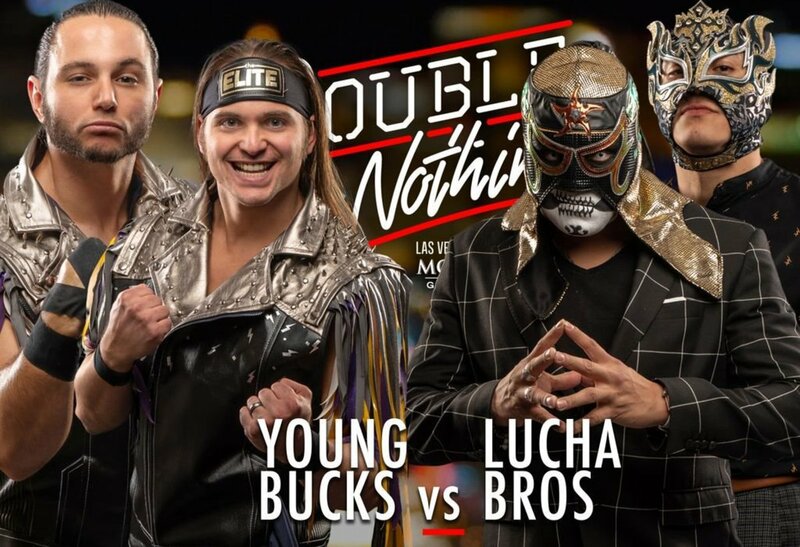 The AAA Tag Team titles will officially be on the line when The Young Bucks face The Lucha Bros at AEW Double or Nothing. While appearing with Kenny Omega on Syfy Wire at the Chicago Comic & Entertainment Expo today, The Young Bucks confirmed that their match against Pentagon Jr. & Fenix at Double or Nothing will be for the AAA Tag Team titles. The Young Bucks won the titles from Pentagon & Fenix at AAA Rey de Reyes on March 16. The Young Bucks being at Rey de Reyes was teased but not announced in advance. They appeared after Pentagon & Fenix won the AAA Tag Team titles from El Texano Jr. & Rey Escorpion, then won the titles from Pentagon & Fenix in an impromptu match. A partnership between AEW and AAA was announced in February. Dave Meltzer reported in this week's Wrestling Observer Newsletter that The Young Bucks winning the AAA Tag Team titles from Pentagon & Fenix was "part of a deal put together by AEW to have a championship rematch" at Double or Nothing.